This toblerone desk sign looks great in any situation, from the receptionists counter to the chairman’s desk. Made from anodised aluminium it comes complete with black ends caps and an engraved insert that is easily interchangeable. Price includes one line of text. 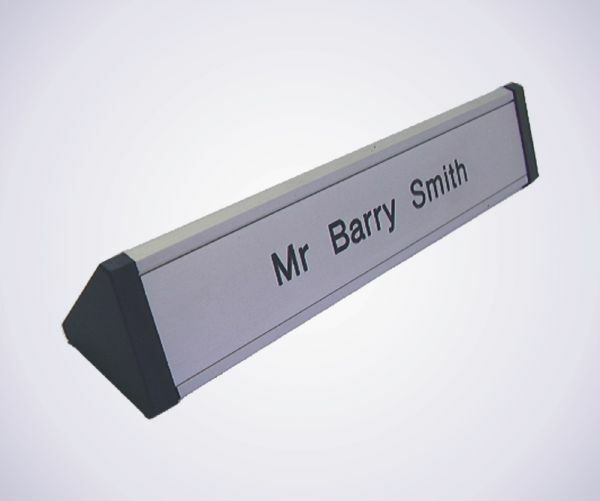 Our Aluminium Toblerones are supplied in a satin silver finish and anodized to an exterior grade. The material will not tarnish or rust and requires minimal maintenance.